I'm preparing to write a foundation single crochet tutorial for the blog. 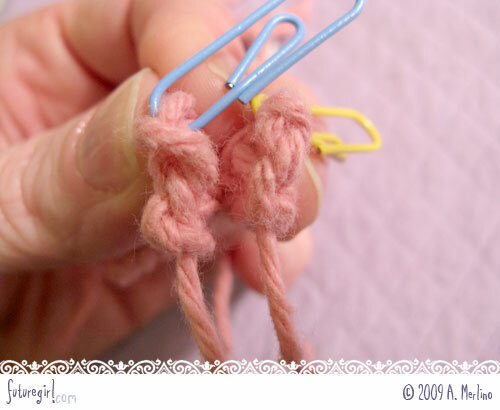 For those of you who are unfamiliar with foundation single crochet, it's the act of creating a row of chain and single crochet all at once to use as a foundation for more rows. It replaces the initial chain that starts most projects. The question I wanted to answer before I started the tutorial is which strands to go under on the initial foundation single crochet. 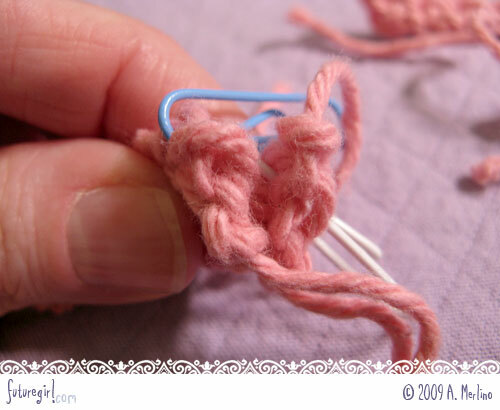 You start with two chain stitches, then you put your hook back into the first chain to start the first foundation single crochet. In my little diagram above, I labeled the three strands of the chain A (right), B (back), and C (left). I made samples that had me putting my hook behind AB, A, C, and AC*. 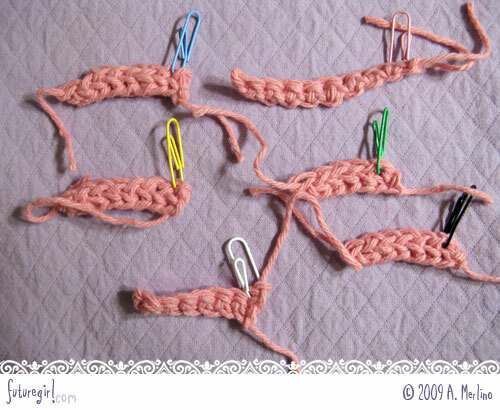 After making all the samples of foundation single crochet, I also made samples starting with a chain and single crocheting into the top and another where I single crocheted into the bottom strand of the chain (which is what I normally do) . 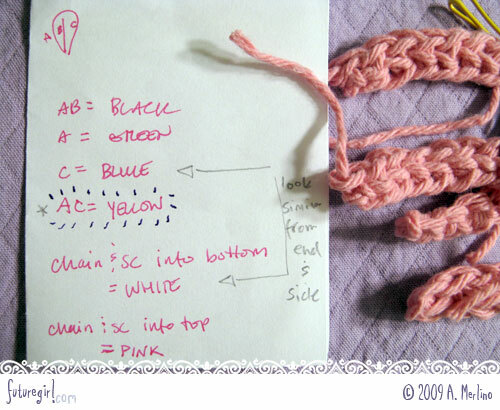 I compared my foundation single crochet samples with the traditional chain and single crochet samples. The blue sample (C) matched the white sample (chain with single crochet in the bottom strand) most closely when viewed from the side and end. But when I compared the yellow (AC) and blue foundation single crochet samples, I liked the profile of the yellow sample more. Also, the yellow sample's leading yarn (the starting yarn end) was securely anchored to the piece. Many of the samples' leading yarns were loose and would tighten up a lot and pinch the end when you pulled them. And, if you didn't pinch the end by pulling them, they were awfully loose and looked like they might unravel themselves. The yellow sample couldn't be squished up by pulling on the leading yarn bit and it wasn't loose, either. Perfect. So now I just need to do the tutorial! * As I was typing that, I realized I didn't do a version where I put my hook behind B, so I tried it real quick and compared it to the rest of the samples. There was a weird space I didn't like. I didn't bother trying BC because I'd have to twist the chains and I'm sure it would look weird. Argh. OK, so I just tried BC and it's almost identical to C. So I'm still set on AC.